Land Vista also has a blog, a Facebook page, and a Twitter feed. 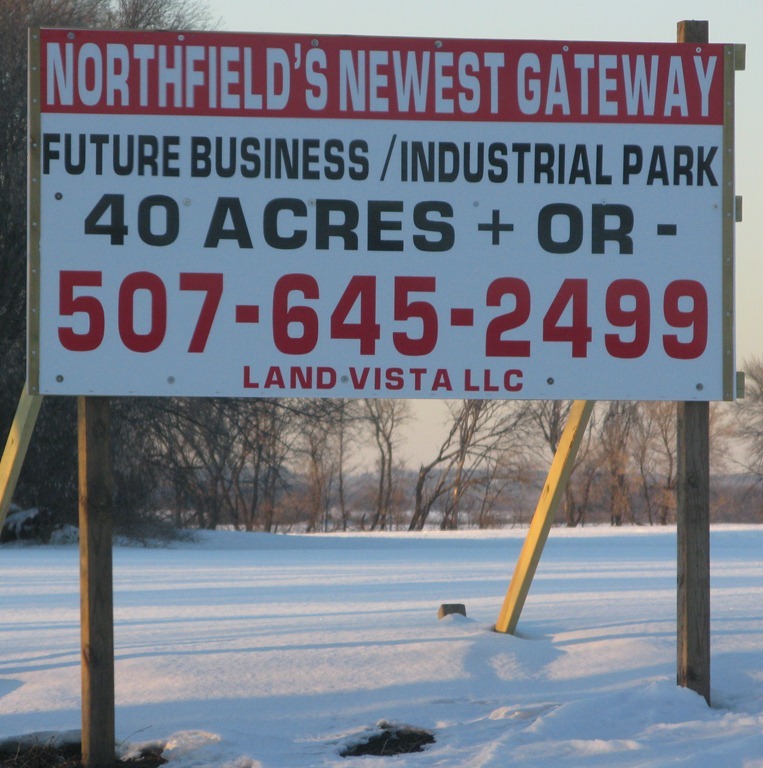 Looks like Land Vista is wasting no time, offering parcels of the Gill/Prawer industrial park even before the City of Northfield and Bridgewater Township have opened up negotiations on amendments to our annexation agreement that could make this project possible. Reminds me of the efforts of Progressive Rail, putting up their big banner on Hwy 19 alongside Malt-O-Meal and Kwik Trip, calling for an ethanol plant in Bridgewater Township. My photos above are of the new industrial park in Greenvale Township on the north side of Hwy 19. Are you sure that Land Vista is doing this for the Gill/Prawer business park in Bridgewater Township? Yes, I believe Larry Larson was at EDA or other meetings where that came out, Somebody want to doublecheck? Part of the pressure to bring the Bridgewater industrial park over to Decker is to connect up with the Greenvale one. Anyone going to Erica’s ward meeting tonight at Valhalla Rm in Buntrock? Students have planned the land use topic, specifically Gill/Prawer. What’s the background on LandVista? They’ve had a similar sign up on Division/246 south of the middle school for years. I see they’ve got a local office on South Water Street… anybody know who’s behind the company?